Building upon a successful model year of double-digit sales growth in 2013, the versatile 2014 Honda Ridgeline returns with a new, top-of-the-line Special Edition model. The Special Edition model, joining the lineup in November, features model-exclusive 18-inch aluminum alloy wheels with black-trimmed spokes, special badging and the popular black trim package from the Ridgeline Sport. The rest of the 2014 Ridgeline lineup goes on-sale today with a Manufacturer’s Suggested Retail Price1 (MSRP) starting at $29,575. 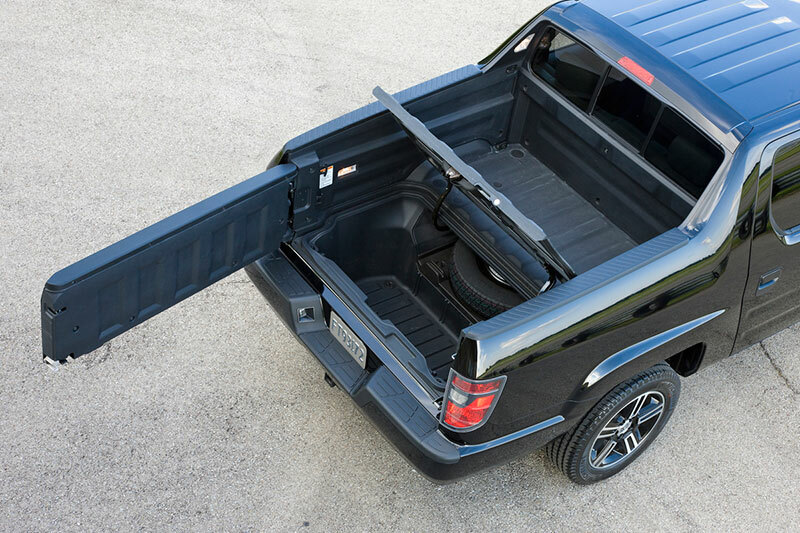 The 2014 Honda Ridgeline features a closed-box, unit-body structure and independent front and rear suspension to deliver a unique combination of truck capability, a spacious five-passenger cabin and car-like ride and handling. The Ridgeline also delivers a maximum tow rating of 5,000 pounds and a half-ton payload rating, all while offering innovative and unique features that include the large In-Bed Trunk® and dual-action tailgate for easy access. Providing more confidence in reverse gear, Ridgeline remains the only pickup truck on sale in the U.S. to feature a standard rearview camera. Four distinctive Ridgeline models are available now: the Ridgeline RT, Ridgeline Sport, Ridgeline RTS and Ridgeline RTL, which is available with the Honda Satellite-Linked Navigation System™2. 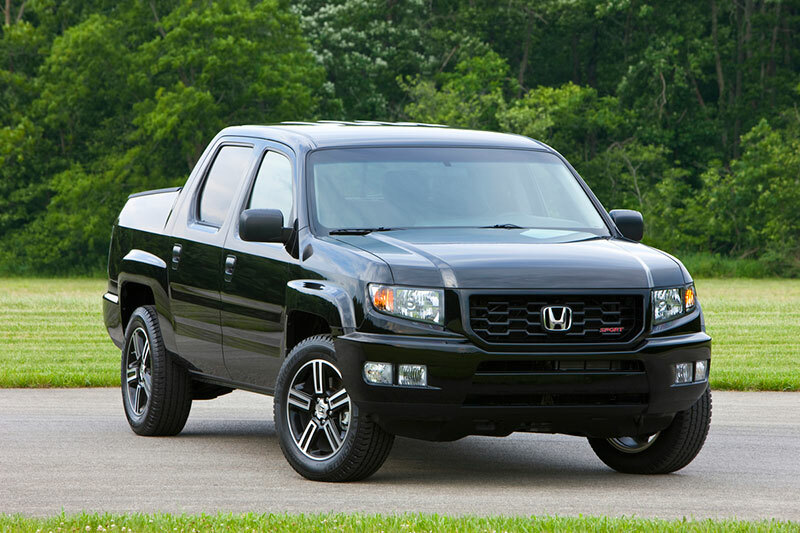 View, build and price a 2014 Honda Ridgeline athttp://automobiles.honda.com/ridgeline. Unique 17-inch steel wheels, integrated trailer hitch, pre-wiring for 7-pin trailer hook up, keyless entry, power windows and door locks, power sliding rear window, air conditioning, tilt steering wheel, cruise control, trip computer with instantaneous and average fuel economy, 6-speaker 100-watt audio system with CD player and MP3/WMA playback capability, rearview camera, and 60/40 split lift-up rear seat with under-seat storage. Exclusive black 18-inch aluminum wheels, black honeycomb grille with black surround and exclusive sport emblem, black headlight and brake light housings, fog lights, leather-wrapped steering wheel with audio controls, auxiliary audio input jack, all-weather floor mats and rear privacy glass. Exclusive 17-inch aluminum wheels, painted inner grille surfaces, body-color painted door handles, 7-pin trailer wiring connector, 8-way power driver’s seat with lumbar support, dual-zone automatic climate control, 7-speaker 160-watt audio system with subwoofer, 6-disc in-dash CD system, steering wheel-mounted controls, auxiliary audio input jack, exterior temperature indicator, all-weather floor mats and privacy glass. Exclusive 18-inch aluminum alloy wheels, fog lights, power moonroof, heated side mirrors, leather-trimmed interior with heated front seats, XM Radio4, HomeLink® remote system, ambient console lighting, 115-volt power outlet and carpeted floor mats. The Honda Satellite-Linked Navigation System™2 with Voice Recognition and Zagat Survey® restaurant information is available on the Ridgeline RTL. It includes XM® Radio4, Bluetooth® HandsFreeLink® and a multi-information display. The navigation system includes a rearview camera display, thus eliminating this display in the rearview mirror. Exclusive 18-inch aluminum alloy wheels with black-trimmed spokes and Special Edition badging on the rear tailgate. The model also adopts the black trim package from the Sport model, which includes black headlight and brake light housings, black tailgate and black honeycomb grille with black surround. The Ridgeline Special Edition also comes standard with Honda Satellite-Linked Navigation System™2 featuring Voice Recognition and Zagat Survey® restaurant information, and includes XM® Radio4, Bluetooth® HandsFreeLink®, plus multi-information display and rearview camera display. Colors choices for the Ridgeline Special Edition are Taffeta White, Crystal Black and Alabaster Silver, all with black leather interior. A fully automatic Variable Torque Management® 4-wheel drive system (VTM-4®) provides confident operation in rain, snow, ice, sand and mud, while also improving on-road and towing performance by distributing torque to all four wheels as needed. The system operates predominately in front-wheel-drive mode during dry-pavement cruising conditions and continuously proportions torque to the rear wheels during acceleration and low traction situations. The VTM-4 lock button located on the instrument panel allows the driver to temporarily hold engagement of both rear wheels to aid traction in the first two gears at speeds of up to 18 mph. Standard towing equipment includes an integrated tow hitch, transmission and oil coolers, heavy duty brakes, dual radiator fans and a wiring harness for a 7-pin trailer hook up (pre-wiring only on RT and Sport). The unit-body architecture is designed for vastly superior rigidity compared to traditional body-on-frame designs and provides the foundation for the Ridgeline’s spacious interior cabin and bed, safety performance and class-leading ride and handling performance. Its modern and athletic design incorporates a solid, one-piece appearance with no separation between the bed and the cab. The windshield wipers have a heated wiper zone to enhance wiper performance in winter driving conditions and minimize ice buildup, while large side mirrors enhance rear vision while towing. A 5-foot-long composite cargo bed with eight tie-down locations provides a payload rating of 1,100 pounds, while four cargo area lights illuminate both the bed and the in-bed trunk. A dual-action tailgate opens down for traditional access to the cargo area or to the side for ease-of-access to the 8.5 cubic-foot In-Bed Trunk®. 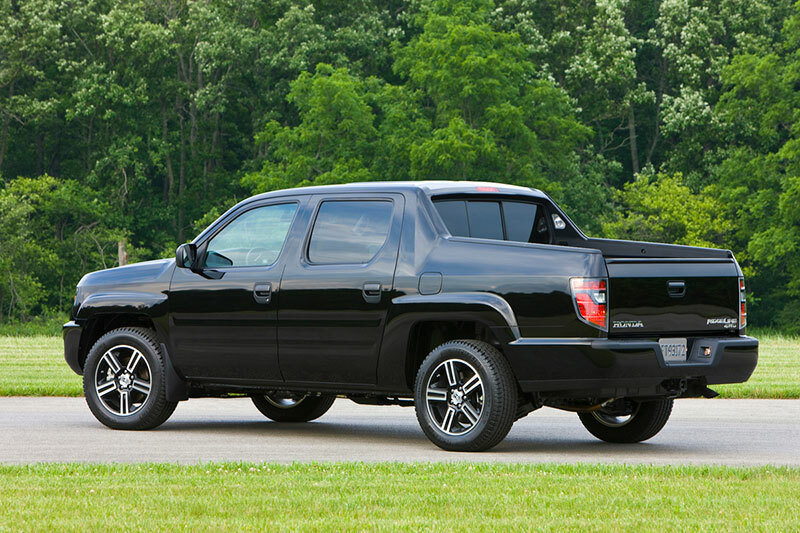 The Ridgeline is available with a wide variety of accessories and can conveniently accommodate motorcycles or ATVs. The cargo area measures 49.5 inches wide between the wheel wells, 20.7 inches deep and 60.0 inches long (79.0 inches with the load-supporting tailgate in the down position). A MacPherson strut front suspension and fully independent multi-link rear suspension with trailing arms provide a smooth ride and responsive handling. A heavy-duty braking system includes 12.6-inch front and 13.1-inch rear 4-wheel anti-lock disc brakes with Electronic Brake Distribution (EBD) and Brake Assist. The Ridgeline RT has 17×7.5-inch steel wheels and P245/65 R17 all-season tires, while the Ridgeline RTS upgrades to 17×7.5-inch aluminum wheels. Ridgeline Sport and Ridgeline RTL models are uniquely equipped with 18×7.5-inch aluminum wheels and all-season P245/60 R18 tires. The Special Edition model features exclusive 18×7.5-inch aluminum alloy wheels with black-trimmed spokes and all-season P245/60 R18 tires. The interior takes advantage of Honda’s unit-body packaging efficiency to deliver full-size interior space dimensions while maintaining garage-friendly, mid-size exterior dimensions. The driving position provides ergonomically comfortable access to large and easy-to-use controls. Between the front seats, a large multi-function console features a sliding armrest and sliding lower tray – each with a hidden storage area. Other console storage areas accommodate large and small items like mobile phones, beverage holders, compact discs and portable digital music players. The 60/40 lift-up rear seats feature a storage area underneath that is large enough to accommodate a golf bag. Plus, the rear seating area can quickly convert for cargo duty by lifting the seats up to create enough room for a full-size mountain bike with the front wheel removed. The rear seat incorporates three LATCH positions for compatible child safety seats. All Ridgelines are equipped with standard safety features including dual-stage, multiple-threshold driver’s and front passenger’s SRS airbags, side-curtain airbags with a rollover sensor, front-seat active head restraints, Vehicle Stability Assist™ (VSA®), a tire pressure monitoring system and daytime running lights. The 2013 Ridgeline received a TOP SAFETY PICK rating from the Insurance Institute for Highway Safety (IIHS), earning the highest-possible score of GOOD in four IIHS tests, including the side impact test and the rigorous roof-strength test. In addition, the Ridgeline is ranked among the best in compact pickup trucks by U.S. News and KBB.com, based on reliability, comfort of ride and refined drivetrain. The 2014 Honda Ridgeline is covered by a 3-year/36,000-mile new-vehicle limited warranty, a 5-year/60,000-mile powertrain limited warranty, and a 5-year/unlimited-mile corrosion limited warranty. Content and images provided by: American Honda Motor Co., Inc.